Chances are, if you're reading this, you're new to the community of Gametechmods. First off, welcome! I'm cephalopod and I'm a Global Moderator here at GTM. We are a primarily English-speaking forum devoted to the robot combat series Robot Arena and it's modifications; If you've made it this far, you probably know at least something about this series. If you are yet to get hold of RA2 and wish to get a copy, all our mods can be found in the Downloads section of the menu bar. Some will require an extra program such as WinRAR or 7zip to open, but the original copy of the game can be opened by any computer. If you need a tutorial on obtaining the game, we have your back! At GTM we do have some rules which you should read before you start posting - these can be found here. As such, we do also have a warning system in place for any infringements on these rules. If you get to 70%, you will not be able to post. Do not hesitate to get in touch with myself or another moderator if you have any queries about the rules or warning system - I promise we don't bite. As you may probably have already noticed, lots of people have many different coloured names on GTM. To avoid confusion, here's a quick overview to them all and what they mean. and other red titles are the people at the top who run the site day-to-day. Our main Admins are Kill343gs and apanx. and other blue titles are the forum's Global Moderators, such as myself. The other Mods you can get in touch with are Geese, 090901 and Pwnator. - Veterans are people who have earned their title mainly from being around in the community for a very long period of time. - Tech Advisor is a title allocated to those extremely talented in coding and technical support. - Advanced Users are members who have contributed significantly in one way or another to the development of the game or community. 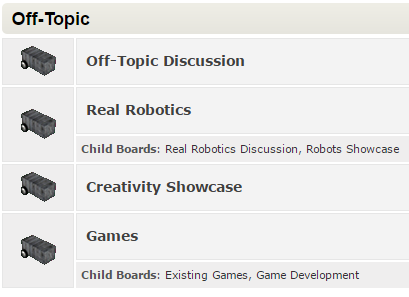 - Roboteers are the real robot builders of the forum. The other smaller grey titles are allocated on how many posts you have made - details on these can be found on the Post Rank wiki page. First off, here's a quick explanation of the top navigation bar you see around GTM. Home - This link will take you to the GTM Homepage, which includes details of your profile, this month's Bot of the Month and the Chatbox, a small instant message widget. Also found here it many user's favourite button - Recent Unread Topics. This will give you a list of all the topics that have been posted in since your last visit to those topics. Forum - The takes you to the main forum page, more on this later. RA2WIKI - This will drop you over at the RA2 Wiki, a community made database of all things RA2 and GTM. Downloads - Your resource centre for all things RA2! Profile - In this area, you can customise your profile, including your Avatar and Signature. My Messages - This is your inbox for Personal Messages. If you have any messages, the number of messages will be placed in brackets beside this. Search - This handy function is for - you guessed it - searching the forum. Very useful if you have technical issues and want to find out if the question has been previously answered. Members - A complete memberlist - useful for getting in contact with people. Rules - This was previously covered, make sure you've read them! Logout - Logs you out of your account. Now I'll briefly go over each section of the forum and what goes there. As you can see, this is the bulk of the forum, and is again largely self explanatory. The Tutorials and Tips area is an excellent way to hone your skills quickly, and we have a complete index of all our tutorials here. If you have technical issues, the Tech Support area should get you a quick response and, hopefully, a fix. Showcases are where we all show off our bots - more on this in a bit. If you want to see how your bots do in combat against other people, Tournaments should be your first port of call. Check the Signups area for any tournaments accepting entries. Don't know how to enter? Use this guide! The Bot of the Month tournament is also held in this area, with the winning robot getting pride of place on the homepage! Everyone needs a break from RA2 once in a while. Come here to chat about other stuff. The Off Topic Discussion section also holds the Introduce Yourself thread, the perfect place to help the community get to know you! Showcases are a particularly busy part of the forum, and for good reason. If you want advice on your bot, or just to show it off, here's where to go! Showcases can be made for any of the mods RA2 has, as well as RA3. All you need to start up your showcase is a screenshot of your bot - this can be done through RA2's inbuilt screenshot system (press F11 and a .bmp screenshot will be placed in the Screenshots folder in the RA2 directory - which must be converted to png or jpg) or through Print Screen and Paint or an external program such as Gyazo. A much more detailed tutorial on good screenshots can be found here, courtesy of Scrap Daddy. A guide on RA2's many robot building styles - as well as examples - can be found here, while browsing other showcases is an awesome way to get inspiration. Updated to reflect changes in GTM's format. Please let me know if I'm missing anything!